. It is slightly more than eight feet from the water to the davits on the aft deck of BRITANNIA. Hauling our inflatable dinghy up, even with multi-part tackles required two people and nearly always hurt our hands. It was also interminably slow, with the dinghy sometimes swaying wildly on the tackles. It wasn’t any better to run the lines to our sheet winches either, because it still meant two people winding, and even slower hoisting. So I decided to do something about it. I considered mounting two hand operated winches on each davit. But winding the dinghy up evenly still needed two people and the high gearing meant it would have been even slower than pulling the tackles. I had watched people at boat ramps, hauling their boats on trailers using an electric drum winch on the back of their vehicles. I found one of these at Northern Tool Inc., (Superwinch LT2000 Model # 1220210 about $100.00.). This is a 12 volt drum winch rated at 2000lbs pull, with a wired remote up-and-down button. They also had one with a wireless remote, but I liked the direct wire connection, with no batteries to go flat, when the dinghy was half way up. We are talking about boats after all. This winch now effortlessly hauls my 100lb dinghy, and a 55lbs outboard, to the head of the davits in 28 seconds. The ‘down’ button lowers it slightly quicker and it can be operated by a child. Judging by the power of this winch, I am sure the model I bought should handle almost any size dinghy and outboard. The winch and fixing down bolts. A piece of 3/8 inch flat aluminum plate, big enough to make the circular winding drum dividing collar. A jig saw with metal cutting blade to shape the dividing collar. A 1 1/8 inch hole cutter, to make the initial hole in the center of the dividing collar. A suitable length of lifting line. I used 1/4 inch braided line. Pulleys to route the lifting line to the head of the davits. Eye straps and rivets to hold the pulleys. 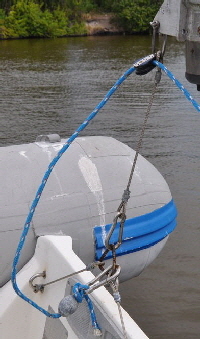 Two machine screws, or self tapping screws, to fix the dividing collar to the winch drum. Two lead fishing weights, to weight the lifting lines. Two carabiner hooks or snap shackles, to attach the lifting lines to the dinghy. A bench press drill with various bits. Unlike a single line on a normal winch, this adaptation requires two lifting lines, one leading to each davit. These lines wind off the winch drum at right angles, then through pulleys to the end of the davits, and down to the dinghy lifting attachments. How many pulleys you need depends on the type of davits and how you route the lifting line. The lifting line is a continuous rope, but it feeds in opposite directions on the winch drum. Therefore, to prevent the lines overlapping and tangling I divided the drum in half, with a circular aluminum divider collar bolted in the middle. I made this from a 3/8 inch thick piece of aluminum plate, large enough to be able to cut a circular collar the same diameter as the outside of the winch winding drum. For the LT2000 winch the collar is 3 1/2 inches in diameter and it needed to be in two halves, to clamp round the winding drum. First I marked the center of the plate, then sawed it in half. I used a miter saw fitted with a 10 inch diameter, 60 teeth per inch carbide tipped blade. This cuts through aluminum, even 3/8 inch thick, like butter, but it could also be done using a hacksaw. The reason I cut the plate in half first was because if I had cut a circular hole while it was in one piece, then sawed it in half, the hole would not have been circular due to the material taken out by the cut. The Superwinch LT2000 winding drum is 1 7/32 inches in diameter, that is, 1/32 of an inch less than 1 1/4 inches. But it would be as well the actually measure the drum diameter, just in case there are variations. I then clamped the two halves of the plates together and scribed a 1 7/32 inch diameter ring with a compass. Then using a 1 1/8 inch hole cutter in my bench press I carefully cut a hole in the middle of the plate to make the initial hole. I then shaped it to the exact diameter using drum disks on a Dremel tool. Great accuracy can be achieved by repeatedly offering the two halves to the winding drum, then grinding a little bit at a time wherever needed. The two halves of the dividing collar now need to be fastened to the winch drum. Unfortunately, the drum on the SL 2000 has a steel shaft running through the middle which prevents bolting the halves of the collar straight though the drum. It was therefore necessary to fasten each half separately, by drilling and tapping a thread into each side of the drum. By clamping each half of the divider collar vertically in my bench press vice I carefully drilled a 3/16 inch hole down the center of each collar to carry the fasteners. These do not have to be symmetrical since each half is held in place separately. I then held one half collar in place, in the middle of the winding drum and using the 3/16 inch drill as a pilot, through the hole previously drilled I made an indentation in the winding drum. This ensured the tapping drill was dead centered in the hole. I then drilled a 5/32 inch (3.5mm) hole into the winding drum and threaded it with a 3/16 tap, I then bolted the divider half in place using a 1 1/4 inch long machine screw. Then I held the other half of the collar in place and repeated the operation. If you feel unable to tap a threaded hole in the winding drum, you can drill a suitable size hole and secure each collar half with a 3/16 inch self-tapping screw. In actual use the collar carries hardly any load, it just separates the two sides of the lifting lines. Before actually bolting the second half collar in place I drilled a 1/4 Inch hole, (the thickness of my lifting line), near the edge of the inside of the collar. This is to allow the lifting line to pass continuously from one side of the collar to the other. I then secured the other half collar, to form a completely round divider. It is worthwhile to use a drop of Locktite on these fasteners, just to prevent them coming loose over time. At first I tried to use the 1/8 inch flexible wire rope which came with the winch, but it was far too stiff and would not wind evenly in both directions off the drum. I found braided line to be much more suitable, and with a breaking strain of over 1400lbs it is considerably stronger than the weight of my dinghy and the outboard combined. The line should first be threaded through the hole in the divider collar until it is equal lengths each side. Then by operating the winch the line will wind itself round both halves of the drum and feed in and out according to the rotation of the winch. It is not necessary to tie knots in the line where it passes through the divider collar, because you will always leave a few extra turns of line on the drum, even when the lines are fully extended, and this prevents them slipping. I bolted my winch motor through the deck in the center, between both davits, but it doesn’t necessarily have to be mounted centrally between the davits. If it is more convenient to offset the winch it is only necessary to run a longer line on one side of the drum than the other. Both will still wind in and out at the same rate. The method of routing the line will also vary with different boats and different shaped davits. My installation was very simple. 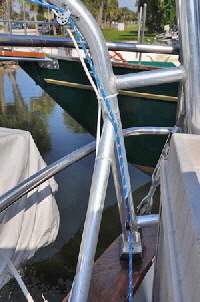 I used 3/16 Inch stainless pop (blind) rivets to attach stainless eye straps to my tubular aluminum davits. Then I simply shackled 1/4 inch blocks to these to ensure a clean lead for the lines to the head of the davits. Unlike the weight of a multi part block and tackle I now had only a single line leading down to the dinghy in the water below. It was therefore necessary to weight the lines so they self-feed off the winch. I drilling out the center hole in two fishing weights, then half-hitched one to each lifting line and these easily weighted it down to the water. I then swaged two short stainless wire strops with thimbles and snap shackles and attached them to the ends of the davits. These are for hooking to the dinghy attachment rings as a second safety measure when the dinghy is fully hoisted. The winch can then be backed off slightly to take the strain of the lifting lines. I also fitted an additional snap shackle on a longer line to the davit supporting the stern of the dinghy. This enables the dinghy to be angled lower when rain is expected, or when the boat is unattended for an extended period, so all water runs out the rear drain. Being open to the elements on the stern of my boat I’m sure the winch would not have looked good for very long, So I encased it, along with its remote control, in a nice teak box with removable lid. This has slots in the side for the lifting lines to pass through. So what if power fails, or the winch breaks you ask? It’s a fair question. I kept the original blocks and tackles, which can easily be shackled to the davits like before to haul the dinghy up or down by hand. But until that might happen, we definitely have one less struggle and the dinghy can now be hoisted effortlessly by one person. So that’s another job the wife can do on her own, and which always attracts onlookers and fellow yachtsmen whenever we use it. Apart from the winch, the only material cost was electrical cable, the lifting line, a small aluminum plate, pulleys and eye straps. Total cost, about $250.00, and worth every penny. NOTE: There are a number of electric winches of varying sizes and power ratings available from different hardware stores and on-line, and they may have different winding drum diameters. If you buy a different winch to the LT2000 the dividing collar should then be made to suit whichever winch is purchased. Dinghy weights also vary, so if you have a really heavy dinghy, like a RIB with a large outboard, you might also want to use a thicker rope than the 1/4 inch braided line I used as a lifting line. 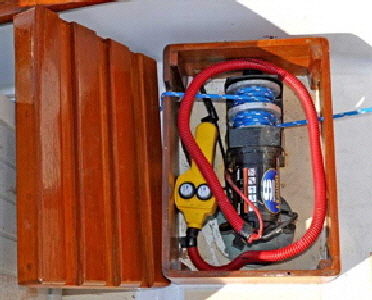 The method of connecting the winch motor to a power source will also vary between boats, along with the length and thickness of cable needed to connect to a suitable battery and breaker.